- Publisher In this warm and inviting guide to creating a more human style of living, Foster guides us on the simple path toward finding God by learning to listen, to give, to understand, to show compassion, and to accept what we already have. - Publisher Written in the same warm, accessible style as Richard Foster's best-selling "Celebration of Discipline, Freedom of Simplicity" articulates a creative, more human style of living and points the way for Christians to make their lives "models of simplicity." Foster provides a way to rethink our priorities and to "seek first God's kingdom and his righteousness." He shows us how to live in harmony with the rich complexity of life while stressing the relation of simplicity to prayer, solitude, and all the Christian Disciplines. In this warm and inviting guide to creating a more human style of living, Foster guides us on the simple path toward finding God by learning to listen, to give, to understand, to show compassion, and to accept what we already have. 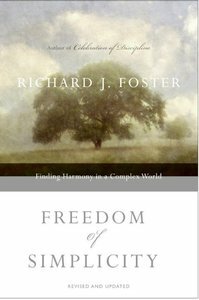 Written in the same warm, accessible style as Richard Foster's best-selling "Celebration of Discipline, Freedom of Simplicity" articulates a creative, more human style of living and points the way for Christians to make their lives "models of simplicity." Foster provides a way to rethink our priorities and to "seek first God's kingdom and his righteousness." He shows us how to live in harmony with the rich complexity of life while stressing the relation of simplicity to prayer, solitude, and all the Christian Disciplines.